In JH band students are taught to perform as a stage band ensemble with traditional wind instruments and contemporary rhythm section instruments (drums, keyboards, guitar and bass). Students are also taught music theory and music history. Students play pep band, jazz, and traditional concert band music. The Grizzly Band performs at pep rallies, football games, chapels and other special school events. All HS band students are required to have at least 1 year of playing experience. All students are encouraged to use their musical talents for the Lord. The Junior High Choir is comprised of 7th-8th graders who love to sing and worship the Lord! This choir meets during one full period of the regular block schedule. They have approximately 5-6 performances throughout the year. These performances include performing in the Downey community and on campus for Thanksgiving and Christmas, as well as competitions at the ACSI Choir Festival and the Music in the Parks Festival at Knott's Berry Farm. The Junior High Choir takes the next step in improving their vocal production, music theory, sight-reading, and rehearsal etiquette. However, the most important goal is to train these students to worship the Lord in everything and to prepare them for high school choir. 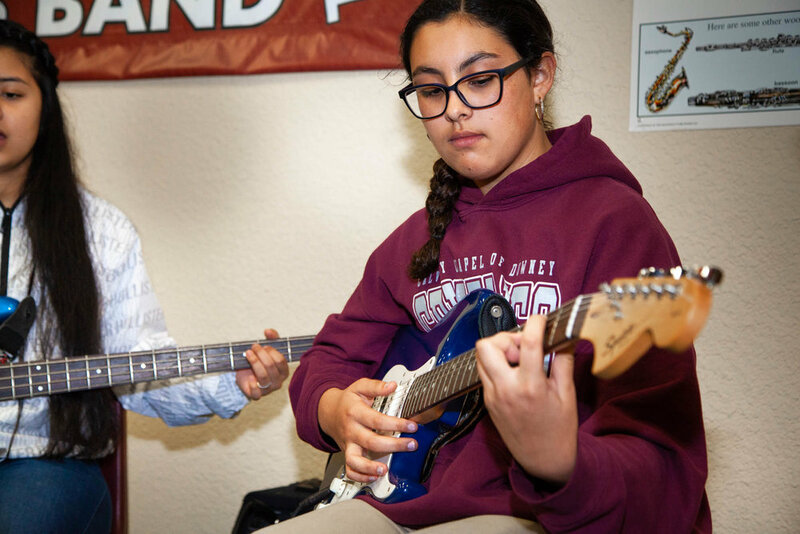 Our JH guitar students are taught contemporary music theory. This course is designed for students of all skill levels. The students are taught their instrument in a small group setting based on their skill level. The students will learn how to read chord charts, use chord inversions, transpose songs and many other important contemporary skills. Guitar students are required to bring their own instrument. All students are encouraged to use their musical talents for the Lord. Our JH worship students lead worship for our weekly JH chapels. This class is designed for students interested in leading worship. This class is for singers and instrumentalists. Students learn how to play current, modern contemporary worship songs. All JH worship team members are required to have at least 1 year of performance experience. All students are encouraged to use their gifts for the glory of God. Our JH keyboard/piano students are taught contemporary music theory. This course is for designed for students of all skill levels. The students are taught on the schools keyboards in a small group setting based on their skill level. The students will learn how to read chord charts, use chord inversions, transpose songs and many other important contemporary skills. All students are encouraged to use their musical talents for the Lord.